(Hollywood, S.C.) On August 6, 2015, Nastagehia Donniece Brave, 23, of Hazelwood Drive, was arrested by the Charleston County Sheriff’s Office and charged with Felony DUI. She is being held at the Sheriff Cannon Detention Center pending a bond hearing. On August 5, 2015, shortly before 11:00 p.m., Charleston County Sheriff’s Office deputies were dispatch to SC Hwy 162 and Chapel Road in Hollywood to investigate an auto pedestrian accident. According to initial reports, the driver, of a gray in color Honda Civic, was traveling east on SC Hwy 162 near Chapel Road when the driver struck a youth on a bicycle. The kid was transported to the Medical University of South Carolina where he later died. The cause of the accident is under investigation by the Charleston County Sheriff’s Office Traffic Division and the Charleston County Coroner’s Office. The Coroner has identified the cyclist as D’Ohndre Varner, 16, from Hollywood. Varner died at MUSC on August 5 at 11:47 p.m. from injuries sustained in the accident. (Hollywood, S.C.) On August 5, 2015, shortly before 7:00 p.m., Charleston County Sheriff’s Office deputies were dispatch to Bohicket Road on Johns Island to investigate a traffic accident. According to initial reports, the driver, of a black in color 2004 Pontiac, was traveling southbound on Bohicket Road toward Esau Jenkins at a high rate of speed while passing several vehicles. The driver attempted to merge back into the proper lane when the driver lost control of the vehicle and collided with a tree. The driver was pronounced dead at the scene of the accident. The cause of the accident is under investigation by the Charleston County Sheriff’s Office Traffic Division and the Charleston County Coroner’s Office. The Coroner’s Office will determine the cause of death and the identification of the victim. 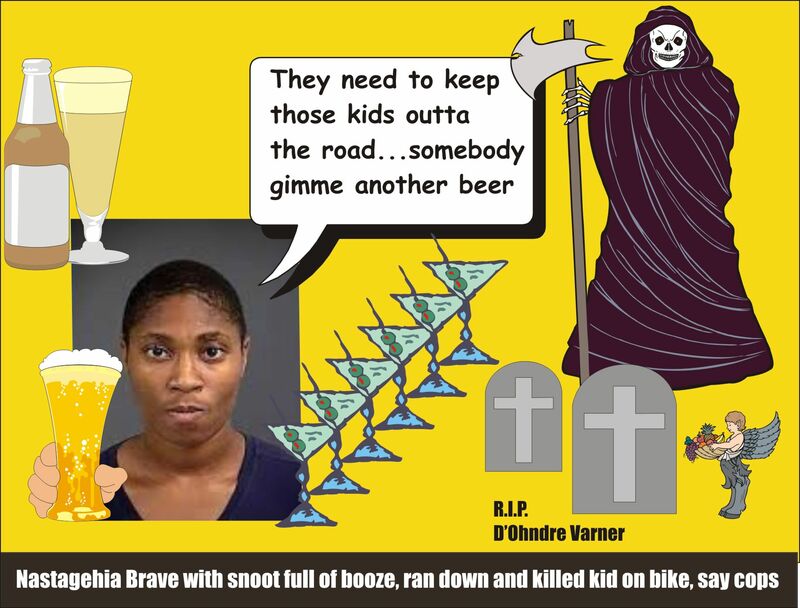 This entry was posted in DWI arrest photos, DWI Arrests by State, DWI crash photos, injury or death and tagged Bohicket Road, Charleston County Coroner's Office, D'Ohndre Varner killed by boozing driver, Esau Jenkins, Nastagehia Donniece Brave charged with felony DUI by Charleston Sheriff, SC Hwy 162 and Chapel Road in Hollywood, Sheriff Cannon Detention Center. Bookmark the permalink.